Chicago—also known as “The Windy City”—is surrounded by statuesque buildings and deep-dish pizza. It’s a city known for sunny mornings and bitterly cold winters. People from warmer climates probably aren’t prepared for a business trip to Chicago in the winter. From finding corporate transportation to bringing an extra pair of socks, here’s a look at five things every corporate traveler should remember. The biggest mistake a person can make is packing the coat instead of wearing it. As a general rule, if coming from a warmer climate, having a heavy coat in the carry-on bag is important. There’s nothing like walking out of the airport, waiting for the car service, and freezing like a popsicle. Using a local Chicago driving service that specializes in corporate transportation will minimize time spent in the cold. 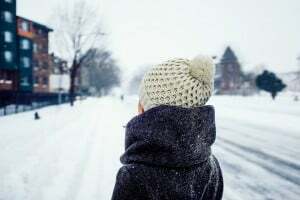 Although public transportation can be less expensive, visitors who are unfamiliar with the transit routes risk getting lost in freezing temperatures. A reputable car service is a convenient way to stay warm while wandering the city. Checking the Chicago weather a few days before the trip will help determine what to pack. Most Chicago winters are cold, blustery, and bone-chilling. Packing extra socks, gloves, hats, and scarves is never a bad idea. Planes, trains, buses—whatever the mode of transportation is, be prepared. Prior to the trip, it’s always a good idea for whoever is responsible for arranging corporate transportation to have a backup plan in case the weather puts a damper on their employee returning safely. One of the surprises Chicago weather can bring is snow—lots of it. It’s hard to predict if and when a snow storm will come, which is why packing extra clothes that can last a day or two is wise. Being over prepared is better than not being prepared to stay a few extra days.